If This is Shyness was a portal into an unbelievable dream-world, Queen of the Night is the tender few moments suspended between that dream and reality. When I first read This is Shyness a few months back, I was exhilarated beyond belief at the remarkably original tale Hall had managed to create, yet, I never felt as if anything was missing. 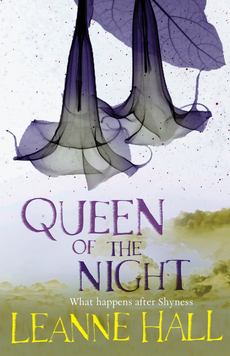 With Queen of the Night, however, Leanne Hall enables us to see just how much more there is to the unique world she imagined. While we are thrown, once again, into the world of Shyness, its mysteries, and the enigmatic lives of Wolfboy and Wildgirl, we are also given, for once, a much more slower, brooding, and thought-provoking experience than we ever had before. It has been six months and thirteen days since Nia last saw Jethro in Shyness and not a day has gone by without her thinking of him. Jethro, however, has not called Nia in the long months they’ve been apart and although Nia doesn’t know it, Jethro is constantly thinking about her too. With the passage of time however, more than just Nia and Jethro have changed; Shyness has changed as well. While the city remains to be as dark as ever, stranger things than usual seem to be happening, one of which is Paul, Jethro’s best friend, wandering the streets with a group of trance-like people dressed in blue. Thus, with more questions than answers and no way to help his friend, Jethro is forced to turn to Nia and request her to return back to Shyness with him. Yet, this time, more than simply their relationship is at stake – their very dreams and reality are too. One of the first things to strike you about Queen of the Night, either than Leanne Hall’s beautiful prose, is just how much you missed the world of Shyness, and, in particular, Wolfboy and Wildgirl although really we all just missed Wolfboy if we’re being honest. Hall’s imaginative land, whether you are aware of it or not, has wormed its way into your heart and returning back to these pages with their languid phrases and contemplative dual narration feels exactly like returning home. While the pacing and focus of this novel is far different from its predecessor, it is also, strangely, exactly right. We are exempt from the shy endearments of Wolfboy and Wildgirl’s first love and are instead treated to a subtle awkwardness as they attempt to re-learn each other without the craziness of one night tying them together. Queen of the Night spans, instead, over a longer period of time as Wolfboy and Wildgirl grow back together and I simply adored the realistic manner in which their romance played out as the novel unfolded. Yet, even more than that, Queen of the Night focuses on Shyness, making this land the most mysterious character of all. Hall begins to peel back some of the clouds covering the origins of this city and while we are granted more answers by the end of this novel, we are also left with an even larger pool of questions. Even more than that though, with her sophomore novel Hall makes us think. While This is Shyness was a journey we were forced to undertake without too much thought, Queen of the Night is a novel that starts out much like any other romance and slowly transforms into a symbolic tale, forcing the reader to question the very substance of dreams, our imaginations, and the barrier between reality and our subconscious. It’s one of those rare stories that leaves you feeling satisfied at the end, but also leaves you hanging and praying fervently hoping for another venture into Shyness. If you haven't read/heard of this series before, you can follow the links above to read my review of the first novel, This is Shyness or just click here. I love books that make me think Keertana! The ones that have me closing the back cover fully intending to pick another book up right away only to find I'm not ready to stop thinking about the one I finished just yet:) Shyness sounds like an extraordinary place, one I don't think I can go much longer without visiting! Beautiful review! You always manage to engage my attention with an author I've never heard of and draw me into really wanting to read a book (on those you love). Again, I seem to be blind to all these amazing authors out there and through blogging and Goodreads my eyes have been opened. Thank you for drawing my attention to this because it sounds brilliant. You really have made me want to read this book. And Wolfboy, you want to crawl into his lap?! Well... I think that says it all for me. I have not heard of this series yet but it definitely sounds like one I MUST read! And Aussie authors? Oh yes- I'm on that train! Those peeps are BRIILIANT! Ahh books with beautiful prose that make you think and amaze you are my favorite, I read a really great review on this awhile,back only to find it wasn't available in the U.S. so now I am off to see if I can get this author now, Just lovely! I have .sanctum up tomorrow. GOSH, I've heard great things about this book + the author and she's AUSSIE! YAY! And geez, I should have read this book when I first heard of it. It sounds AMAZING. Thanks Heidi! I'm always so disappointed to find that these Aussie authors are SO hard to find in the US! WHY? I hope you can find this book though - I love it!